Just getting started with veganism? Then shopping can be a nightmare. Even those simple vegan meal plans will probably call for ingredients which you’ve never even heard of, cooked, or had in your pantry. To make the process of going vegan easier, you will want to stock up on some vegan pantry essentials. There are already a lot of vegan shopping lists out there but I’ve found that most of them are really impractical. They are either really long and detailed (do newbie vegans really need agar-agar and 5 types of seaweed on hand?) or the vegan shopping lists are like the one which PeTA has are full of vegan junk food. I’ve compiled a practical vegan shopping list. By practical, I mean that you 1) won’t have to spend a fortune stocking your pantry, 2) you will be able to make just about any basic vegan recipe so long as you have these foods on hand. As someone who lives in a really tiny apartment and is perpetually broke, I understand that you aren’t always (or ever!) going to have all of these vegan ingredients at home. Instead, I’ve broken up the foods by categories: proteins, carbs, greens, vegetables, fruits, and fats. For example, lunch might consist of wholegrain tortillas (carb) filled with black beans (protein), sautéed onions (vegetable), tomatoes (bright-colored fruit), and kale (greens) topped with avocado (fat). Or maybe I’ll make a quick stir-fry with chickpeas (protein), red peppers (colorful fruit), onions and garlic (vegetables), and broccoli (greens). I serve it with wholegrain pita bread (carb) and some tahini dressing (fat). For most new vegans, the hardest part of meal planning is going to be getting your greens. Don’t skip on the greens though because these are going to be one of your most valuable natural sources of iron, calcium, and many minerals. Try to eat dark leafy greens or other green veggies (like broccoli or cabbage) with each meal. If your main dish doesn’t include greens, you can always eat a green salad. I admittedly don’t eat greens with breakfast. Since iron and calcium can be major issues for vegans, I make sure to add some superfoods to my breakfast – such as by topping my oatmeal with nuts, seeds, and berries. Always make sure to include protein with every meal, which isn’t really that difficult. You can get in protein simply by adding nuts to your breakfast cereal, seeds on top of your salads, and basing your lunches and dinners around a protein like lentils, beans, tofu, seitan, or tempeh. A lot of newbie vegans make the mistake of loading up on carbs but forgetting the other categories. I once had some vegan guests staying with me. For dinner, they made baked potatoes with pasta. Except for the tomato sauce, the entire meal was whitish in color (you’ve heard about eating the rainbow, right?). It left me feeling like I had a brick in my stomach. If you eat just carbs, you are probably going to end up with a nutrient deficiency, feel like crap, and get really bored with your food quickly. It is easy to overlook the fat requirement when planning vegan meals. Fat is incredibly important for your health, it adds flavor to meals, and it helps you feel satiated. Without fat in your meals, you’ll probably find yourself craving cheese or eating a lot of junk foods. My personal favorite vegan fat is avocado, which I spread on bread or blend up into a creamy dressing. Ideally, your meals should include one ingredient from each category. This way, you ensure you are getting all of the necessary nutrients your body needs. The category method also makes finding substitutions for vegan recipes easy. For example, if you don’t have beans for your burrito recipe, you could substitute another protein like seitan in its place. ***A lot of newbie vegans make the mistake of stocking up on grains and carbs but forgetting the other categories. Then end up just eating pasta everyday and eventually develop nutrient deficiencies that leave them feeling like crap (plus bored with their food). Don’t forget your greens as these are really important for iron and calcium! ***Before anyone calls me out on it, yes I realize that a lot of these foods could go into different categories. Like I know corn is a grain not a vegetable! Quinoa is also a complete protein (it is actually a seed). 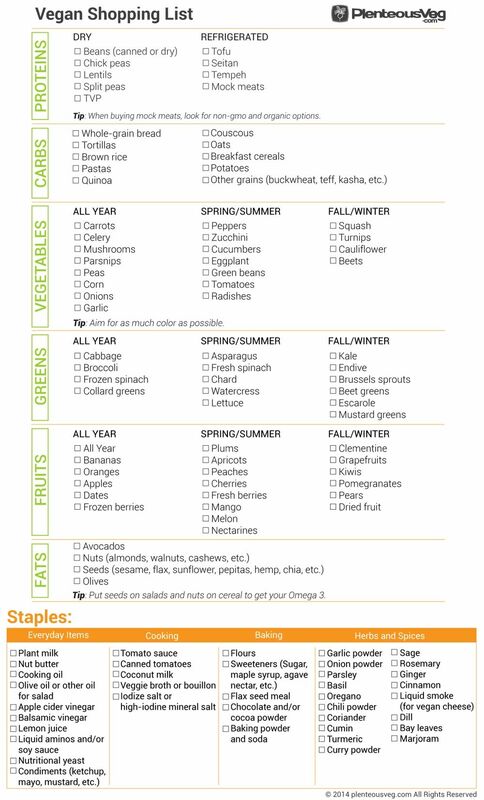 But, for the sake of meal planning, I grouped foods based on the way they are generally used. One common concern with vegan diets is whether or not they provide all the vitamins and minerals that we need. Some people claim that whole-food diets provide all requirements for your body, and others even advise against using any supplementation at all. The truth is, a vegan diet can provide all vitamins and minerals for your body if it has been carefully planned. However, this is easier said than done. You will need to spend a good amount of time researching the nutrients of each food and figure out if you are lacking any, and most people simply do not have the knowledge or the patience to do this properly. For the majority of us, taking a vegan vitamin and minerals supplement will ensure that we are getting all the nutrients we need. In addition, you will always need to have certain vegan staples on hand. Some of these are staples for any pantry, like flour and cooking oil. Some are specifically vegan, like plant milks and nut butter. If you like to bake, then you will want to have staples on hand like flax meal (acts as an egg replacer in baked goods). You’ll notice that the list of vegan spices and herbs is pretty long. A lot of vegan foods (like tofu) are really bland and need to be seasoned like crazy to make a tasty meal. Since seasonings are cheap to buy, so it is worth it to actually stock up your spice rack. Obviously, the list doesn’t include everything that all vegans would consider a staple. But it is a good starting point. If you’ve got these in your pantry, then you can make just about any basic vegan recipe with just the addition of one or two ingredients. When I first went vegetarian and then later went vegan, I ended up spending hours in the supermarket reading labels and trying to make sense of the ingredients. This might seem like a hassle, but I actually consider it one of the biggest benefits of veganism. Reading labels helps create food awareness, and thus helps you learn to make healthy food choices (which is one more reason vegans are so much thinner and healthier than most meat eaters – read more about veganism and weight loss here). Don’t worry. Vegan shopping will get easier over time. But, at the start, you should really allocate a lot more time to grocery shopping than you normally do. In the meantime, here are some tips and tools to make vegan shopping easier. After a while of being vegan, you will become a pro at reading product labels. In two seconds flat, you’ll be able to scan a label and spot whether it contains casein, gelatin, milk powder, or any of the many other animal-derived ingredients which often make it into processed food. You’ll also get better at remembering which products are vegan friendly so you don’t have to read the labels anymore (though companies do sometimes change the ingredients, so it is worth it to give the ingredients an occasional re-checking). 1. Look for the Vegan Label: When reading a product label, the first thing you’ll want to look for is whether it contains the vegan label. If it does, then you don’t even need to bother reading that lengthy ingredient list. 2. Check for Cholesterol: Next, look at whether the product contains cholesterol. Cholesterol is only found in animal products. So, if the nutrition info shows that it has any cholesterol in it, the product is not vegan. 3. Scan for Obvious Offenders: Now, it is time to start scanning for the obvious offenders. Again, I want to reiterate that you’ll soon get really good at scanning labels. If you don’t quickly find any obvious offenders, then you can read the ingredient list more carefully to find some less-obvious animal ingredients. 4. Don’t Get Fooled: Remember not to get fooled by phrases like “non dairy” or “lactose free” on product labels. This does not mean that the product is vegan. For example, you will find a lot of soy-based cheeses which have casein – a milk derivative. When you first go vegan, you might not want to focus on all the “small stuff” like whether that Red Dye #40 is from animal origins, or whether the vitamin D in your fortified orange juice is vegan or not. For starters, focus on cutting out the obvious animal ingredients (eggs, gelatin, butter, etc.). Once you get the hang of this, then you can start eliminating products which have hidden animal ingredients, like these products which surprisingly aren’t vegan. The list of hidden animal ingredients is really long, and it is virtually impossible to remember them all. My solution to this is to simply not eat foods which contain weird ingredients I’ve never heard of before. Instead, I (mostly) just eat real foods which don’t require ingredient lists, such as fresh fruits and vegetables, legumes, beans, and whole grains. It makes grocery shopping easier and is a lot healthier, not to mention cheaper than eating processed foods. Another issue is that many ingredients can be either plant or animal derived. For example, lecithin is usually from plants but can also come from animals. When in doubt, you can contact the company or go online to check. Even more confusing are the animal ingredients that might be used in processing. For example, bone char is often used to purify sugar, beer, wine, and even apple juice. Because the bone char is only used in processing and no traces of it are left in the actual food, the manufacturers aren’t required to include it on the ingredients list. To completely avoid these animal ingredients, you’ll have to do a lot more research. Again, don’t stress about it too much right now. Focus on eliminating the obvious animal ingredients. Once you master this, you can work on those hidden animal ingredients. You aren’t perfect and you will probably make mistakes somewhere down the road, like that time you ate bread with animal-derived monodiglycerides. Don’t beat yourself up about it! Some people get so upset by one little mistake that they throw their hands up in the air and say, “screw it!” and go back to eating meat. Congratulate yourself for taking the step of going vegan, learn from your mistakes, and move on. If you accidentally purchased a non-vegan item and haven’t eaten/opened the product yet, just give it to a friend or donate it to a food bank. Bone char is often used in processing sugar, so not all sugar is vegan. Veg Scan app: This is by far the coolest vegan shopping app out there. You just hold your phone up to the ingredients and it will scan them, letting you know if the product is vegetarian or vegan. Vegan Yum Yum app: This app has a checklist of ingredients which are vegan and not-vegan. It does not have a product list though. Whole Foods Market Recipes app: You can use the app to find vegetarian or vegan products in the Whole Foods store. Just Buy Two Ingredients from Each Category!